The Team off for another great day! Participants will receive regular formal training (ADMAT's Underwater Survey Diver course unique to ADMAT) and artefact handling with informal teaching on Maritime Archaeological practices, some are listed in the course details below. All students will be required to take part in all activities, equipment, maintenance, survey plans and photography. This is very much a team activity. The more you put in the more you will get out of this project. This is not for people who want to sit on the beach relaxing and do nothing. 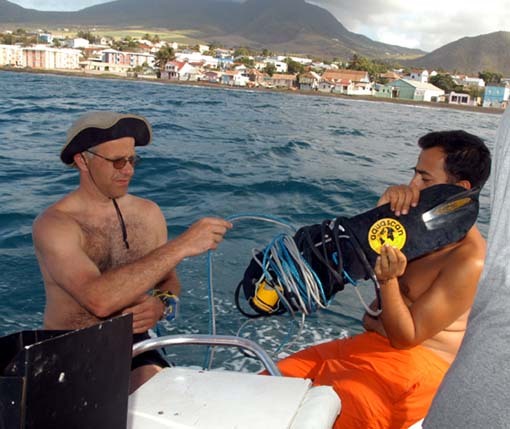 This is a diving archaeological project, and participants will be required to dive/work on land as well as underwater. 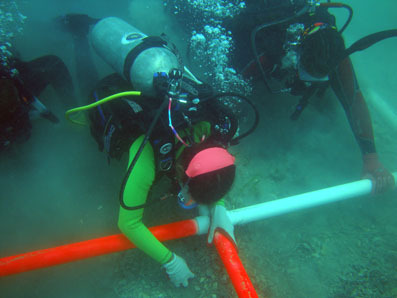 Underwater Mapping & Surveys, The Principles of Artefact In-Situ Recording, Artefact Registration, and Archaeological Photography, and Aquascan metal detectors/graidometers, The Wrecking Process and Ship Construction. The fees for the field school are: $1,600.00 US per week for the first two weeks for current university students and $1,750.00 US per week for Team members who are not currently students; for the diving and $1,000.00 US per week for non diving positions. There are further discounts for members staying longer than two weeks. This is excluding flights and transfers, alcoholic drinks, diving and medical insurance and personal spending money. These fees are inclusive of all administration, breakfast, packed lunch on the boat, evening meal, drinking water, ice and cordial, tuition, and diving. All students must fly into Santiago Airport code STI. This is the closest airport at 2.5 hrs drive each way. 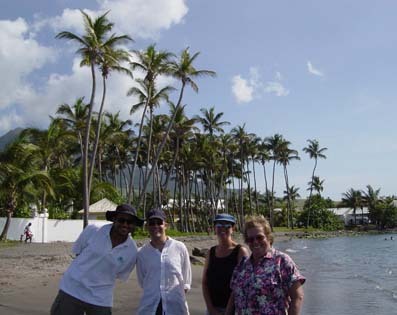 On occasions the team may fly into the alternative airport Puerto Plata Airport code POP if the prices for the majority of the team are better flying into this airport. Once the team has been decided then the airport will be chosen. If your application is successful, an invoice will be sent after acceptance of your application form, where upon the full field school fee amount is to deposited into ADMAT ’s bank account in the UK. 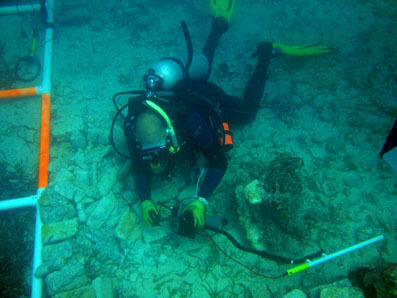 There is an inherent risk associated with diving and conducting archaeological work / training underwater. ADMAT France, ADMAT USA, Anglo ~ Danish Maritime Archaeological Team Ltd and/or their affiliates or related corporations, partnerships, agents, principals, staff, local Volunteers or employees shall not in any way be liable for accidents, injury, death, inconvenience, damage, incidents, injuries, theft, loss of diving or enjoyment due to bad weather, losses of causes of action of any kind incurred during, or arising out of, or in connection with your stay at this field school or the use of the project equipment or personnel. Students, Participants, Volunteers, Project members expressly agree to assume all risks associated with the contemplated activities foreseen and unforeseen. Project members assume all responsibility for any medical condition and should consult their doctor if they have any medical conditions that are not compatible with strenuous diving activity. It will be a requirement that all project members, volunteers, students howsoever named, accept this clause when they make their reservation. They will be required to have appropriate diving/accident medical insurance such as DAN insurance. Raimund uses the DX200 graidometer. Raimund marks a target for further investigation found with the DX200. Close inspection of the squares prior to hand fanning. Working the dredge tail gate to ensure there are no small items accidentally removed by the archaeologists on the dredge head. 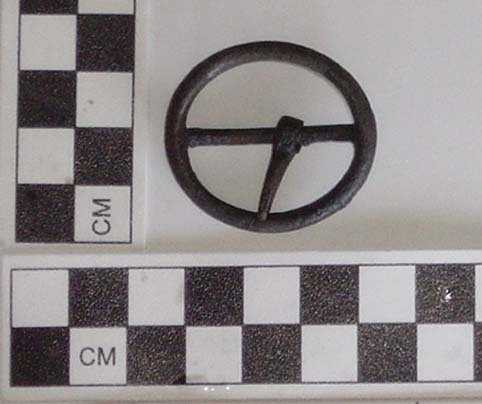 A bronze clench bolt found just below the surface in survey square D3. A close up of the bronze bolt. Ruth and Wesley hard at work measuring the planking. Survey square D0 after hand fanning showing the hull planking. 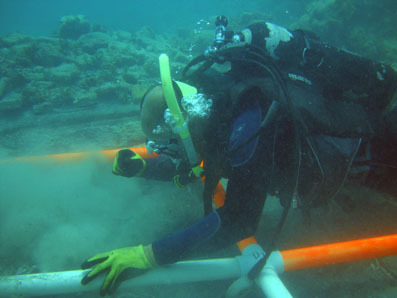 Raimund cleans out the coral rubble and moved ballast bricks from the space between the futtocks and floors. Ruth finding a copper alloy thimble in survey square C3. Raimund hand fanning survey square C0. Raimund placing the archaeological water dredge on to survey square B2. Wesley checking his measurements in survey square B1. A piece of lead sheeting, with coral growth found on the wreck site. Another lead crystal scalloped shell class perfume bottle found on the wreck site. Can you spot the bronze clench bolt head which has partially been uncovered? Gould, R. A. (2000). Archaeology and the Social History of Ships. Cambridge: Cambridge University Press. Lavery, B. (1987). The Arming and Fitting of English Ships of War (2nd edit.). London: Conway Maritime Press Ltd.
Martin, C. J. M. (1995). The Cromwellian Shipwreck off Duart Point, Mull: An Interim Report. 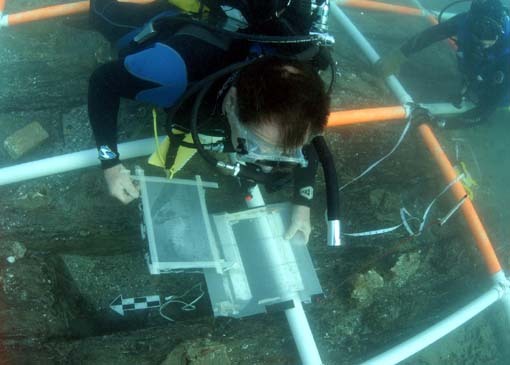 The International Journal of Nautical Archaeology and Underwater Exploration. 24.1:15-32. Mathewson, R. D. III. (1975). Historic Shipwreck Ceramics: A Preliminary Analysis of Olive Jar Data from the Wreck Site of the Nuestra Senora de Atocha. Boca Raton, Florida: Department of Geography, Florida Atlantic University. Muckelroy, K. (1978). Maritime Archaeology. Cambridge: Cambridge University Press. Spooner, S. Q. (2002). 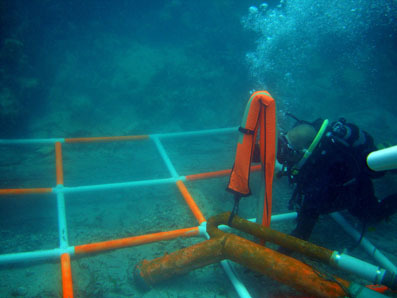 Underwater Survey Diver Archaeological Course. Anglo ~ Danish Maritime Archaeological Team. PDF available to participants on line or by disk. Spooner, S. Q. (2004). Protecting The Caribbean's Historic Shipwrecks. A New Model For Success in Mediterraneum 4: Massa Publications, Napes- Italy. PDF available to participants on line or by disk. Spooner, S. Q. (2004). The White House Bay Wreck, Interim Archaeological Report. London: ADMAT Publications. PDF available to participants on line or by disk. Spooner, S. Q. (2006). The Button Wreck, Interim Archaeological Report. London: ADMAT Publications. PDF available to participants on line or by disk. Steffy, J. R. (1994). Wooden Ship Building and The Interpretation of Shipwrecks. London: Texas A&M University Press, Chatham Publishing.